Before I start on my challenge this month: The A To Z Blogging Challenge I must talk about how March went and let you all in on my hopes and goals for April. I didn't clean out any kitchen cabinets and that laundry room closet is still waiting on me. I am determined that I am going to do this in April. And I mean it!!! Make waffles, quesadillas, and breakfast burritos for the freezer. Yes, I accomplished part of this. I made the quesadillas and the breakfast burritos and I also make Chicken wraps. Was nice to have something for the kids on weekends. I am keeping with the freezer cooking. This month my goal is to make 3 casseroles for the freezer. I worked more on my spreadsheet. Continue to refine the spreadsheet I am liking this. Also I have almost every bill now set up to pay online! Yay me!! Upload more digital and use less paper. I am getting very good at this. I set up my grocery list on my Out of Milk app. And then I go to my grocery store app and see if they have any coupons for what's on my list and I load them to my shopping card. Awesome. Continue right on with this! I called the nurse more often when I needed help with things like meds and advice and comfort. 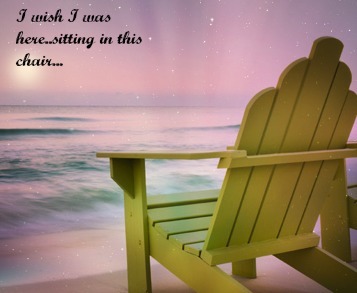 April....I am not only forgiving myself but I am looking into taking a few days vacation all by myself. That will be a first for me. If I can pull off the couple of days vacation that I am thinking about then I will be worrying less and loving myself more. How are you coming with your goals? 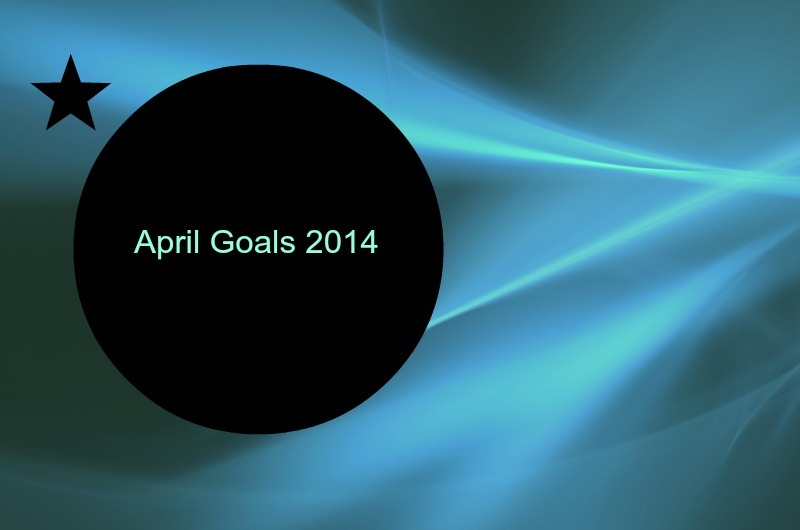 Isn't it easier to break them down into monthly goals? Those recipes with * if you click on them will take you to the web page when I got the recipe from. You will note some of these were on my menu last week and we just didn't get to them. We had dinner delivered to us on Thursday from a very good lady. Friday Darian had a friend over and we splurged on Papa John's Pizza. And the Chicken Curry was nasty and I will be taking it off my list. No one in this house liked it and I threw it all away. Maybe we are just not curry people. I am linking up with I'm an Organized Junkie for Menu Plan Monday. Want to join us? We are very, very close to April 1. I am going to give you a sneak peek at my very first post. "I've met my share of assholes. On my journey to give him care. There have also been some angels. A few of them to share. If you want to read more you have to wait until April 1. I am getting ready for the A To Z Challenge so I have run out of creative ideas to write about. Maybe I haven't really had any in the first place. But I am tired of writing about my life. So it SUNDAY STEALING DAY! 1. When you buy a greeting card, are the words or the picture more important to you? It has been so long since I purchased a greeting card. I have a program on my computer to make cards should the desire to send one hit me. And I think the words are more important. 2. What is your favorite kind of cake? White cake, white icing. 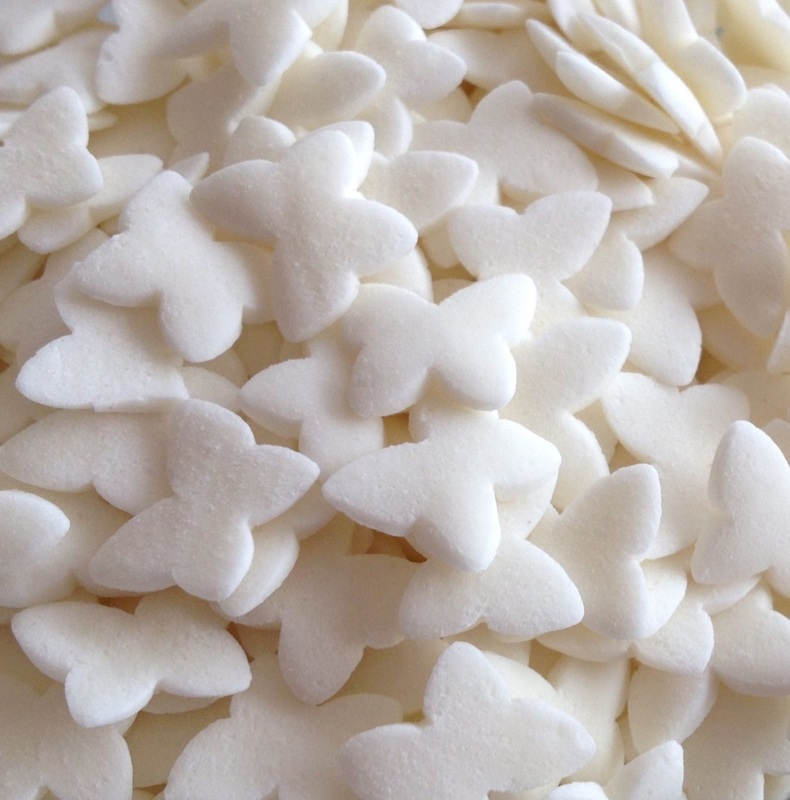 Thick, white icing. 3. Do you ever make gifts for people? If so, what? Or do you buy them? 4.You are chosen to have lunch with the President. The condition is you only get to ask one question. What is your question? 5. Which do you dislike most: pop up ads or spam emails? 6.What was the best party you have ever been to? Easy peasy...the party celebrating my graduation from nursing school. It lasted 48 hours! 7. Which is worse being in a place that is too loud or too quiet? 8.You are offered an envelope that you know contains $50. You are told that you may either keep it or exchange it for another envelope that may contain $500 or may be empty. What do you do? A gambler or risk taker I am not. However, I have a fifty-fifty chance (which are good odds) and I didn't have anything when I started so I am going to change it for the other envelope. Fingers-crossed! 9 Do you wish cell phone etiquette was a required class upon purchasing one? I don't think it would matter. Pigs are Pigs! 10. What is the most messed up good combination that you have had that was actually good? 11.What is one of your most random pet peeves (something that really annoys you)? People who are late. I cannot stand being late and people who are late annoy the piss out of me. 12. When is the last time you had home cooking? 13. If you could be a fictional character from a book, who would you chose? 14.If you could be in a television sit-com, which would you chose. Two and a Half Men....and I would beg, beg, beg them to take it off the air. Because it is the worst comedy on TV. 15. 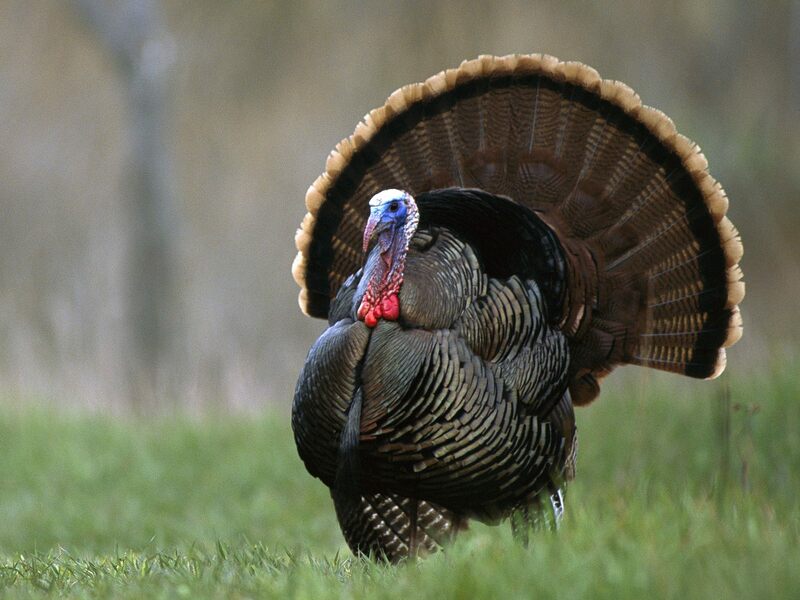 If you could be any animal or creature for one day, which would it be? A cat....lay in the window, in the sun, purring and then meow for my supper. And scratch and claw whomever annoyed me. 16. What is your favorite girl's name? Tough question...when I was younger I wanted to change my name to Constance and be called Connie. Lately I heard the name Charlie Rose for Daphne on the Chew. And I love it! 17. What is your favorite boys name? I knew this was coming...I like strong masculine names: Like Charles, Richard, Micheal. 18. What is your supermarket of choice. I live in Dillon's country. Started here many many years ago. Bought out by Kroger but we still call ours Dillon's. And we have a brand spanking new Dillon's Market Place just up the street. 19. If you were to attend a costume party tonight, what or whom would you go as? I am not going. I don't much care for parties anymore and the idea of a costume party makes me shudder. It is okay if I politely decline? 20. What is your concession stand must have at the movies? I don't go to the movies but I would have to have buttered popcorn and a box of Good and Plenty! Now if you want to play along just head over to the Sunday Stealing site and link up. I haven't done a Saturday Nine in quite a long time. Today, I just don't feel like being 'real'. I am bummed. And burned out. So I am keeping it light. Too Close: Hear the song here. 1. This song is about friendship that turned romantic. Have you ever crossed that line with a friend? How did it turn out? Yep, my husband started out as my boss, then my friend, then the friend to my sons, then my companion, then my roommate and now my husband. I would say that it worked out great! 2.When he was a kid, this week's singer Alex Clare, listened to his dad's Steve Wonder records. When you were in 7th/8th grade what records were you into? Oh my gosh! Now this will really date me. I was into the Beach Boys, Bobby Vinton, Paul and Paula, Skeeter Davis. But music back then wasn't anything like now. We had 45 records we listened to. Actually they belonged to my aunt. Rarely do I ever remember music on the radio. And we certainly never owned anything where we could carry it around with us. 3. "Too Close" has been featured on the TV show, "The Vampire Diaries". Do you enjoy shows, movies, books about the supernatural. 4. Some of Alex Clare's tour dates were sponsored by Bud Light. Do you like beer? Yep, and Bud Light is my favorite. Due to my care-giving responsibilities I don't drink it very often though. 5. Mr. Clare trained to be a chef, just in case the music thing didn't work out. Are you a good cook? Eh, I don't know that I would really call myself a cook. I can put together a recipe and it is okay. Sometimes it is fabulous. I am more of a 'fixer' of food. 6. Crazy Sam is forever running out of mayo because she slathers it on her sandwiches. What is on your grocery list? I have to stop and go check my Out of Milk app (have you tried that for your smart phone? It is great) I need Melatonin, jelly beans, juices, pickle relish, snack cakes, spray bottle , pinto beans, beef round steak. 7.Where are you most likely to find spare change? In the washing machine, between the sofa cushions or under the floor mat of your car. None of the above. Most of my spare change finds its way into the ashtray of my car. Once I found $40.00 worth of change stuffed in there. 8. How did you spend your Friday night? I spent it the way that I spend all of my nights. Sitting in the living room with my husband. Him in front of the TV. Me on the computer. Kids doing their thing. Darian had a friend over for the night and Harley went to bed early! 9. Do you use Pinterest? Yes! I love Pinterest. That is where I put all my ideas for future use. I need to go over there and do some cleaning though. It is getting really, really full. Time is getting closer. Time to write for the A To Z Challenge. My theme this years is going to be about my crazy, care-giving life. I'm writing my posts in my own kind of poetry style. Is that okay? Kind of sing-song style. Nothing too deep. I am tired of too deep. But a lot of it dark for care-giving is mostly dark! Some of it will be funny. Cause sometimes it just is. 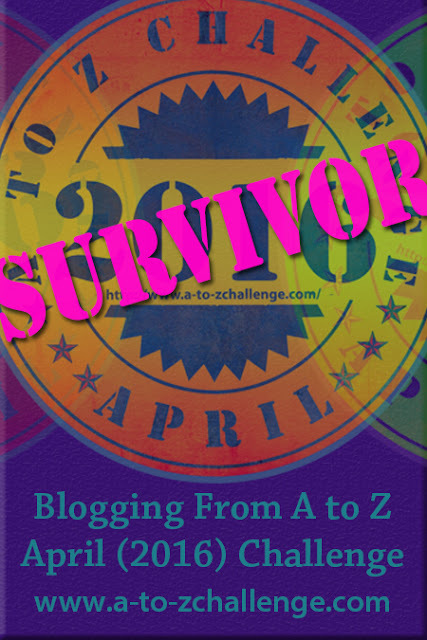 I am number 205 on a list of 1774 people who have signed up to blog on the A to Z Challenge. Now that is just crazy! 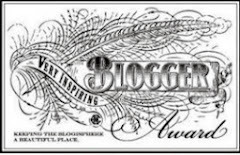 My plan is to visit 10 new blogs everyday. I can't promise that I will leave comments on 10 new blogs but I am going to bookmark those who get my attention and I can go get to know them better after April is over. 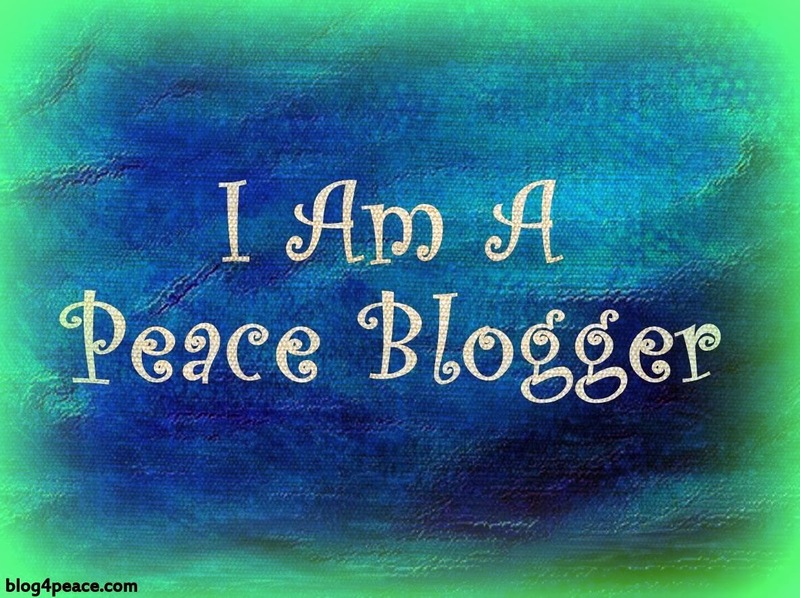 My goal is to find more blogging friends. Maybe some that share my same interests. What about you? 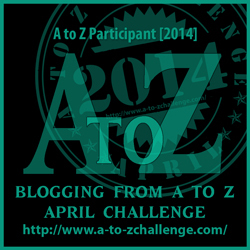 Have you signed up yet to do the A to Z Challenge? You still have time. Just go here. Do you know what I like about Wednesday's? Not that it is the middle of the week and getting closer to the weekend. Because everyday is the same to me. I have to make a sign to hang in the living room to keep Richard oriented. But it helps me too. The only way that we know that it is the weekend is the kids are out of school. Nope what I love about Wednesday's is Finish This....So go over to Nicole's blog, Three 31 and join in. 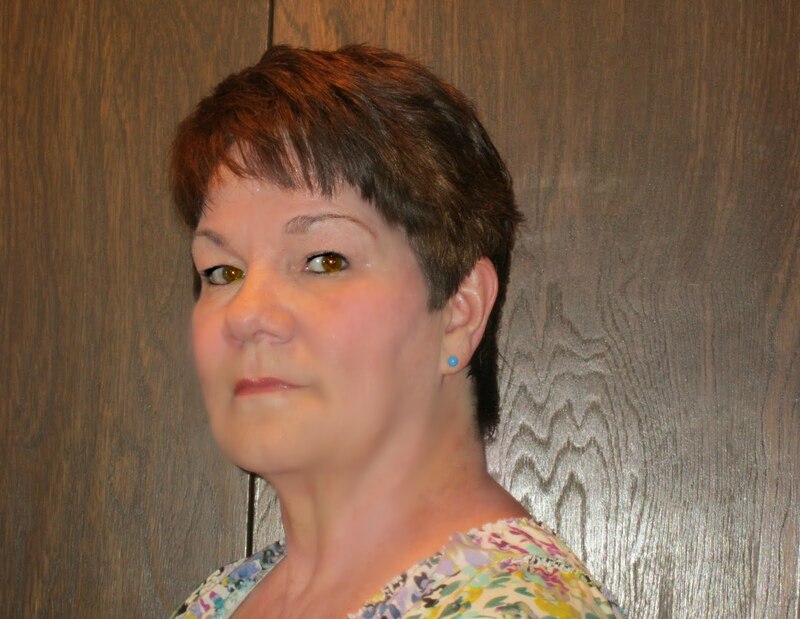 And also I am going to give a shout out to my new blogging friend, Lisa, who is now hosting One Word Wednesday for caregivers, or anyone else who likes to write to a word prompt. Go visit her. And tell her I sent you. I know it is a little weird but.....I like to watch Dog The Bounty Hunter. It is so cheesy. But the reason that I like to watch is that Dog reminds me of my oldest son. The estranged son. The son who is the father of the kiddos that I am raising. This son is tall and lanky with a bit of a belly. Just like Dog. His face is haggard. He has a history of jail. Just like Dog. And he used to wear his blond hair in a pony-tail. Just like Dog. But unlike Dog, his is real hair. Not hair extensions. And like Dog he has tried his hand at working for a couple of bails bondsmen. So there. Now you know that I am a little bit weird. When stopped at a stoplight, I.....look around to see who is stopped beside me and what they are doing. Or glance down at my phone to see what it is doing. I don't text and drive but I will answer a text at a stoplight. Now that I have a new Droid Mini, she reads me my texts and I can answer while driving. But mostly I like to see who is in other cars and imagine where they are going. My guilty pleasure is.....potato chips and sour cream. I have pounds and pounds that are resting right here on my hips (and thighs and stomach) that are directly related to loving to drown my sorrows in potato chips dipped in plain sour cream. Yum! My favorite way to unwind is....a cocktail or a glass of wine, cheese and crackers and a bowl of green grapes. And Army Wives in the DVD player. Every Saturday night when my youngest son, Justin, comes to stay I head to my bedroom, close the door, and unwind. Just like this!! Thank you Justin. Now I am on my way over to Nicole's blog to see how everyone else Finished These....care to join me? My new blog friend Lisa, who blogs at MY SWEET PEANUT (I love the name) is the full-time caregiver to her mom, who has Alzheimer's. Since I have met up with her, and others who are in (or have been) in this same position as I find myself, it makes coping with our confusion, sadness, joy, good times and bad times easier for me. We share and offer each other encouragement. Lisa has decided to start a link-up called One Word Wednesday and I want to invite all of you who are or have been caregivers to come and join. This week the word that she has chosen is nurture. Nurture! As a verb it means to care for, to encourage the growth or development of. And as a noun it means the process of caring for or encouraging the growth or development of someone. I have not always been a nurturer. And I am not really certain that I am all that good at it now. Sometime along the way I found myself needing to become more educated so that I could provide a good living to two sons. So I went to our local community college to see what I could find. They had just started a new Associate Degree in Nursing Program. The counselor, who was helping me, really tried to get me excited about this program. I wasn't buying into it at all until he told me how much money nurses made. At that time so long ago it was $8.69 an hour. Sounded like a fortune to me. So I signed up. I wondered if I would be able to do the job. I don't particularly like sick people or their body fluids. I was luckily blessed with kids who were never sick and I dealt very little with illnesses. Not long into the program, while sitting with an elderly lady at a nursing home, I found my niche. I was amazed at how much I instantly cared for what this little lady was saying to me as I held her hand and listened. Yes, nursing was for me. I graduated and went to work on the 11p-7a shift, where I continued to work for the next 20 years. In a hospital. Like most nurses, I was often spread too thin. Lots of tasks. Staff to direct. Care to be given. And many hands to hold. It seemed like it was at night (when the rest of the world sleeps, but not the patients in a hospital) I learned how to nurture. It is not a God given talent in my estimation. I think you have to put something into it. I had to learn how to do it. And I fell in love with being a caregiver. A nurturer. I spent a few years working in long term care before Richard had his stroke and needed me full time at home. Being a full-time nurturer is the hardest job I have ever had. It has brought me more happiness and more heartache than I could have ever imagined. I have no intentions of doing it any other way. As long as he needs me I will be here to nurture him. 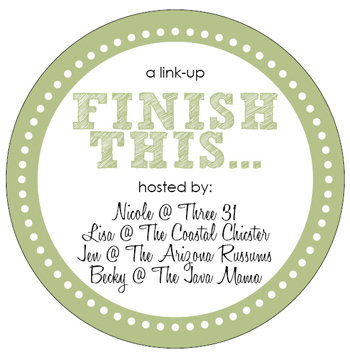 Thank you Lisa for this new weekly link up. Now you all go check her out and leave your story. Tell us why you are (or are not) a nurturer. Go on...you know you want to! 1. 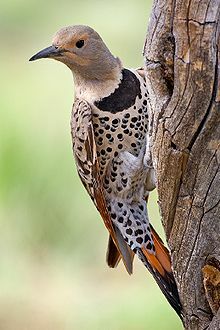 A Northern flicker-I wasn't sure what this was until I looked it up. Looks much like a woodpecker. 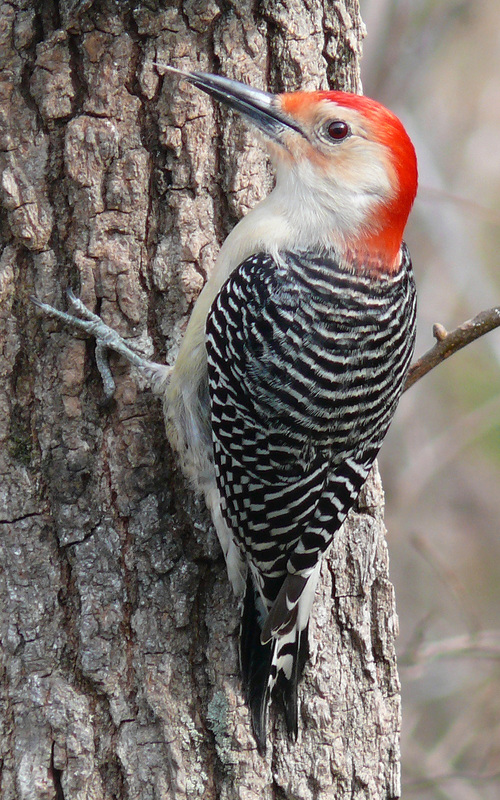 It does come from the woodpecker family. 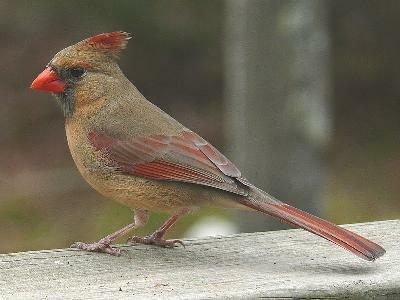 The one that visited our suet feeder had a pretty white head but otherwise looked just like this one. 2. Plenty of crows. These are the ones that bug me. But they need to eat too, I guess. They can empty a feeder in no time at all. And aren't really that fun to watch. 3. 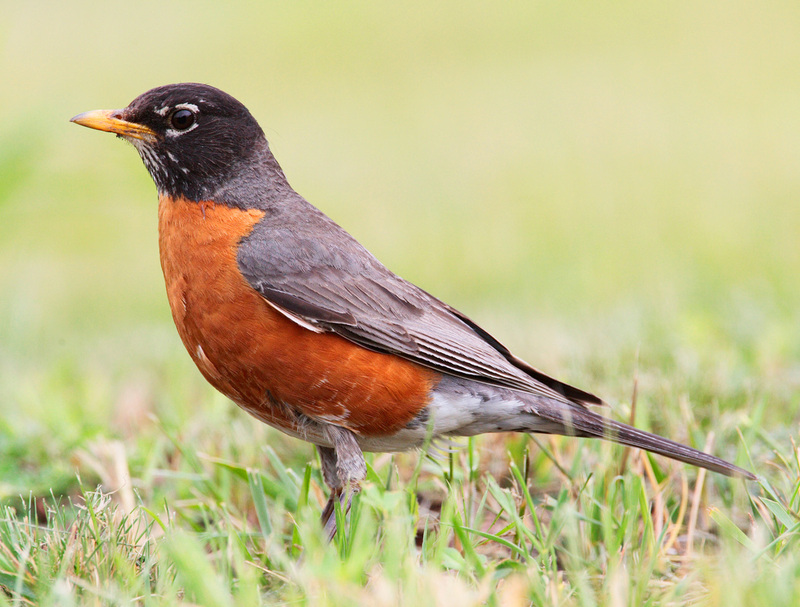 A Robin....these don't usually eat at the feeders because they like worms. But we have seen them out there hopping around and pecking in the ground to get the first bites of those tender, fresh spring worms. 4. I love the cardinals. 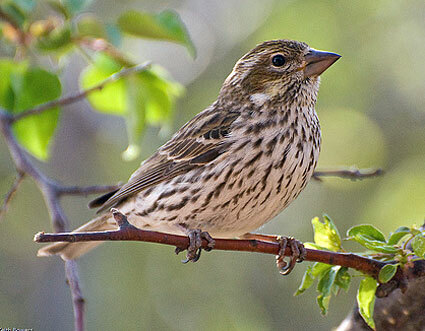 We have seen both the females and the males. 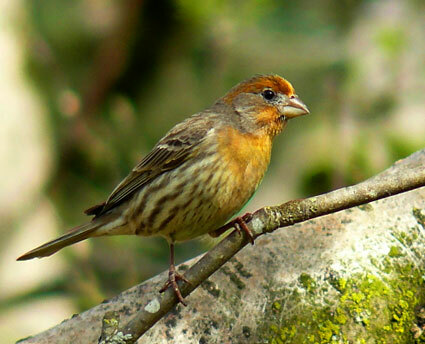 The males are such a bright red and without many leaves on the bushes yet they really stand out. 5. 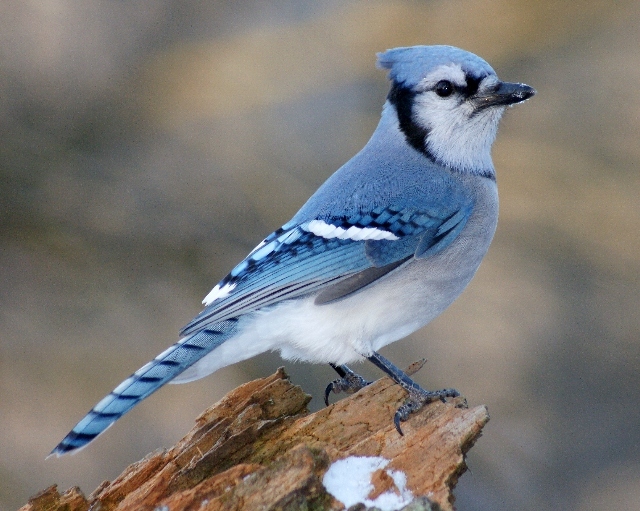 The blue jays are a nuisance bird as well. 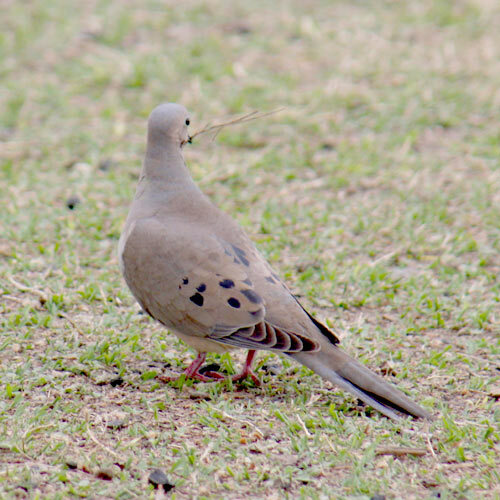 But we have plenty of them and we have come to love their visits as well. 7. 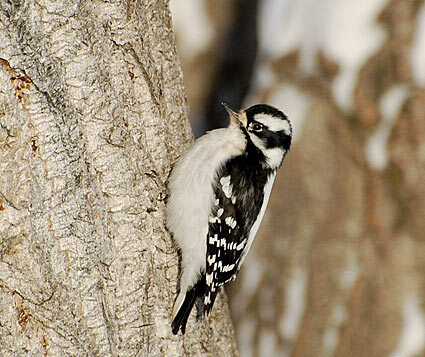 And we have a few variety of woodpeckers. The big red-headed ones and the smaller 'downy' peckers. They love the suet best. 8. 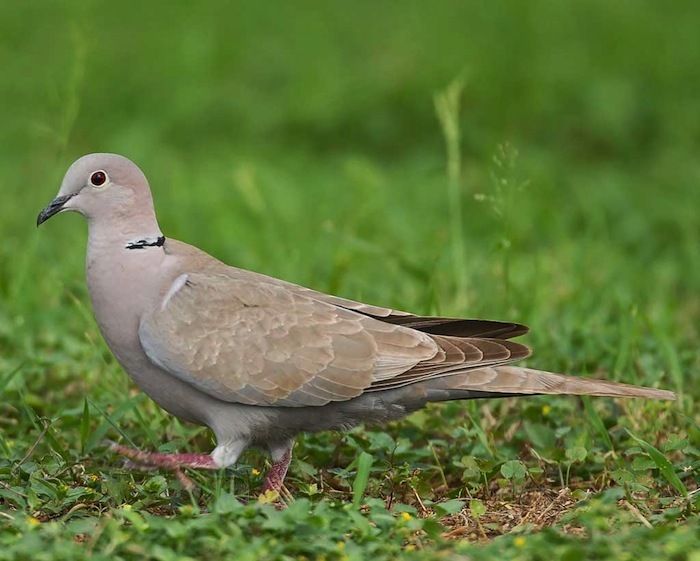 We have a couple of variety of doves and so far this year I have spotted both the mourning doves and the Eurasian doves in our backyard. 9. 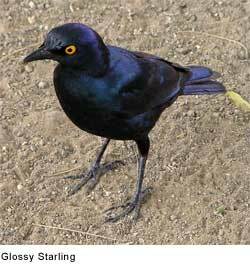 We have a flock (and I think the whole dang flock comes too) of starlings. 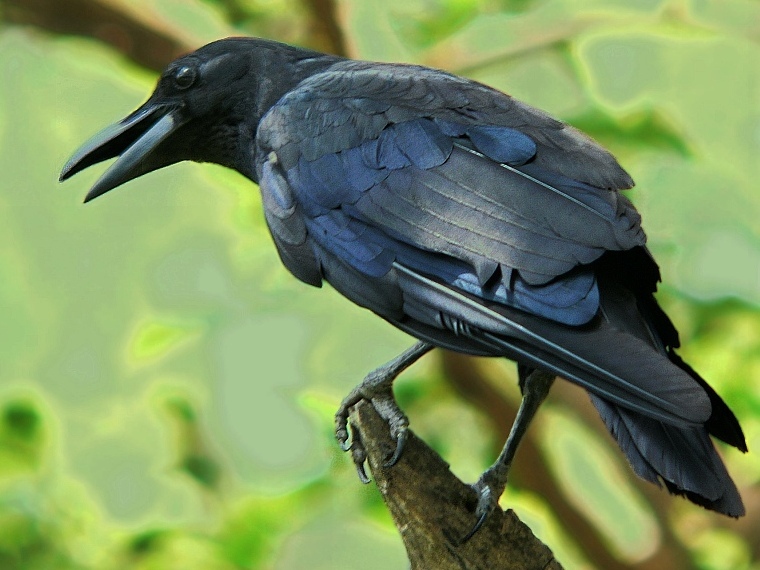 They are kind of like the crows. 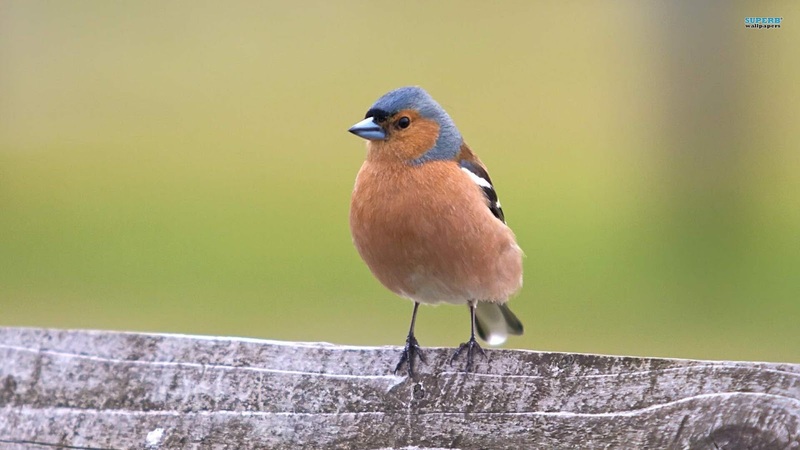 But they won't stay all summer so soon there will be feed for the other birds. They are so hungry. 10. Overhead most days I can spot a few ducks flying. 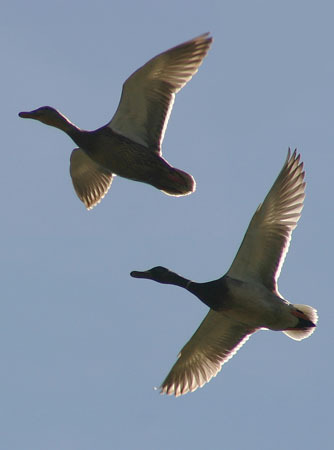 We live close to several ponds and lakes so they are always flying over our house. Haven't ever had any stop by to dine. 11. 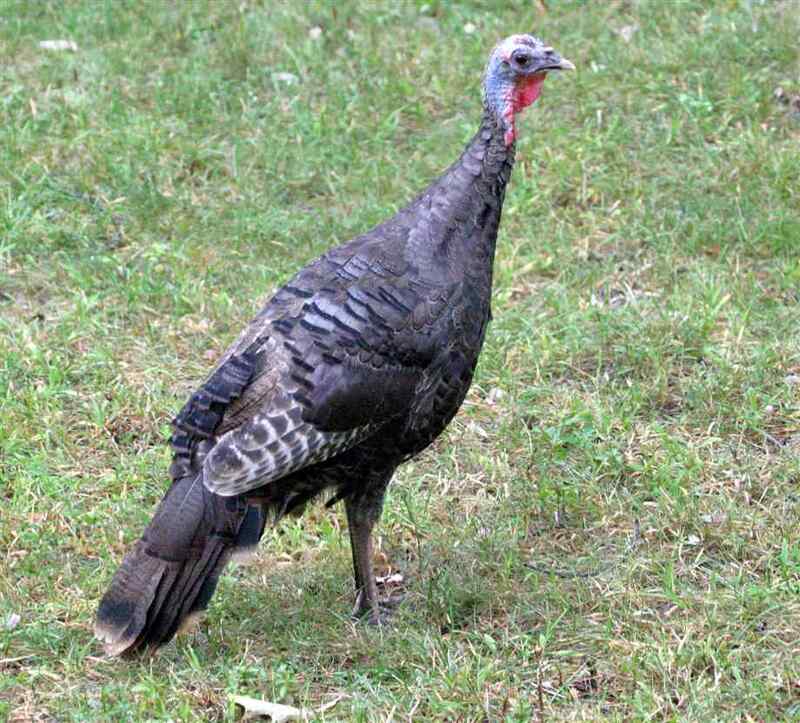 We do have a huge flock of wild turkeys. And I have to admit they are our favorites. Right now the males are flirting and gathering their hens so we often see them with their tails all fluffed out and their heads bright blue. Quite a site to see. 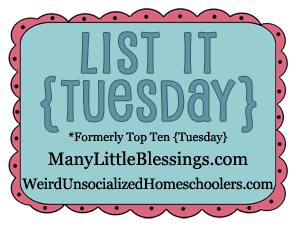 I am linking up with Many Little Blessings List It Tuesday. Won't you join us? (I'll have to wait until she puts up the link to link up...but I will be there. There, now I feel so much better. A full week of menus planned and shopped for. We are mostly a basketball loving family here. Well, my grandson doesn't really like it. He doesn't like to play and he's not that 'into' watching it. My husband and my son like football lots better, but do watch our state teams when they are playing. This year we had the good fortune to have THREE colleges in the NCAA Tournament representing Kansas. 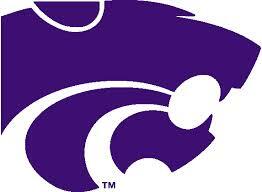 Kansas State represents Division One and is in the Big 12 Conference. It is also the college my husband attended before he was drafted many, many years ago. Granddaughter Harley loves Kansas State and the color purple. Unfortunately K-State fell to Kentucky (56-49) Friday night. We had a bit of a cry-fest but went on to watch the next game. programs in the history of college basketball. KU is where my youngest son graduated from in 2000, so of course his daughter is a huge KU fan. And we were happy to watch them beat East Kentucky on Friday night (80-69). Valley Conference. They have the honor of being the first EVER team to finish their regular season with a 31-0 record. On Friday night with a win against Cal-Poly (64-37) they took their fame one step further by becoming the first team EVER in NCAA history to post a 35-0 record. So we anxiously awaited this afternoon to watch the two Kansas teams that were left in the tournament. We were ALL cheering on both of our Kansas teams. Sadly it wasn't to be a Kansas team this year. 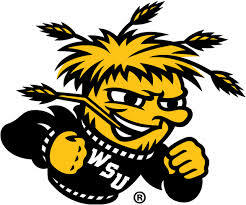 KU lost to Stanford 60-57 and The Wichita Shockers lost in a very hard fought game to Kentucky (78-76). We are proud of all three Kansas teams. Well done guys!!! I am always looking for a new, simple recipe that I think my family will fall in love with. I made this on Saturday night and I am telling you it is a keeper. We had it with mashed potatoes and gravy and broccoli with cheese. It was so good. I used just chicken breast, thawed. I found the recipe in March's Woman's Day Magazine that my ex-daughter-in-law gave me for Christmas. Love simple recipes. Heat oven to 450 degrees F. Lightly oil a large rimmed baking sheet. Place the flour in a shallow bowl. In a second shallow bowl, beat together the egg and 1 tablespoon water. In a third bowl, combine the panko, parsley, 1/4 cup Parmesan, and 1/4 teaspoon each salt and pepper. Toss with 1 tablespoon oil. Dip the chicken in the flour, then the egg (letting any excess drip off), and finally in the bread crumb mixture, pressing gently to help it adhere; transfer to the prepared baking sheet. Roast until the chicken is golden brown and cooked through, 12 to 15 minutes. Heat the broiler. 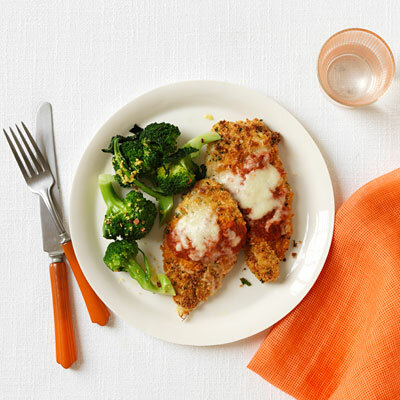 Spoon the marinara sauce over the chicken and sprinkle with the mozzarella and remaining 2 tablespoons Parmesan. Broil until the cheese melts, 1 to 2 minutes. 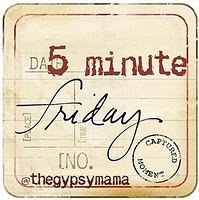 It is time for Five Minute Friday. Where we just write. Without editing. Without over-thinking. We are supposed to feel safe. And then we link-up with about a zillion people who can come and read everything you wrote. Oh, and you only write for Five Minutes on a word that Lisa-Jo chooses.And the one, and only rule, is to visit the person who linked right before you. 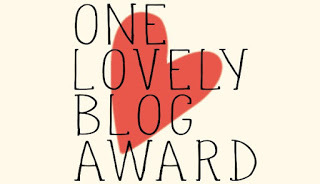 This week when I went to her blog to see what the word was my heart sank. JOY! There is no small way in hell that I can spend five minutes writing about joy when joy is just not something I am feeling today. Or really so much for the past few years. Or maybe for my whole life. I hear people talk about joy. I see people act joyful. But I honestly have never felt that curl your toes joy people talk and write about. And I question! A lot! And everyone. About everything. Is this the life that God really wanted me to have? What is it that I am supposed to be learning here. I am currently reading The Bible In a Year...in chronological order. And boy do I have a lot of questions. There isn't much joy in Deuteronomy. If you know what I mean. Don't get me wrong. I am happy about things. I am happy to see my husband smile. I am happy that my grandchildren are safe and happy. I am happy when my son comes over on the weekends. But joy! Nope I just don't have that earth shattering joy! Sorry. Now go read about Joy on Lisa-Jo's Blog. Maybe I will get some small hints as to what others find is their joy. Soon I will be starting the A to Z blogging Challenge. 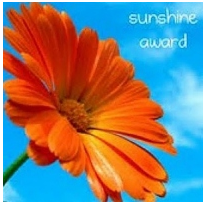 This challenge started out as the brainchild of Arlee Bird who blogs at Tossing It Out. The premise behind this challenge is to blog everyday in April, except for Sundays, which leaves 26 days. For each of those days your blogging prompt is the letters of the alphabet. For example, April 1 is A...like apples. April 2, will be the letter B...like boys and so on. 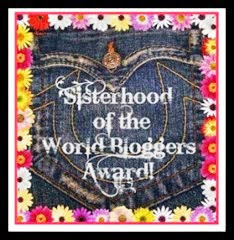 Until the last day of April when you have reached the letter Z and blogged for 26 straight days. You are allowed to use a theme or you can just blog random. 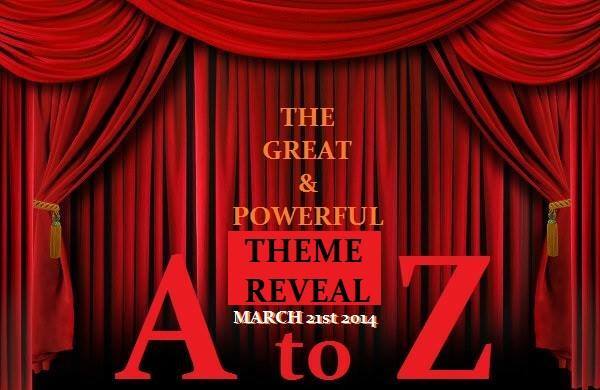 For even more information you can click on over to the A To Z Blog. I have chosen a theme, just like I did last year, when my theme was places that we have visited. Last year in March, when I decided that I was going on this journey, known as the A to Z Challenge, I was also beginning the journey of being sole caregiver (along with a nurse from Hospice) for my husband. He has end-stage Parkinson's disease. It has been a very challenging year I have learned a lot. I have cried a lot. I have started the grieving process. 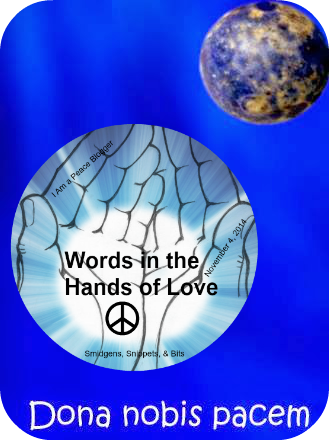 This year my theme is going to revolve around my care-giving journey. I am going to try my hand at a different style of writing. Just the thoughts as they flow out of me. A type more like a sonnet or epic style poetry. I have a story to tell. A story about our days. I want to tell it from A To Z. My theme is going to take us on a Care-givers Journey. I hope that you will join me. 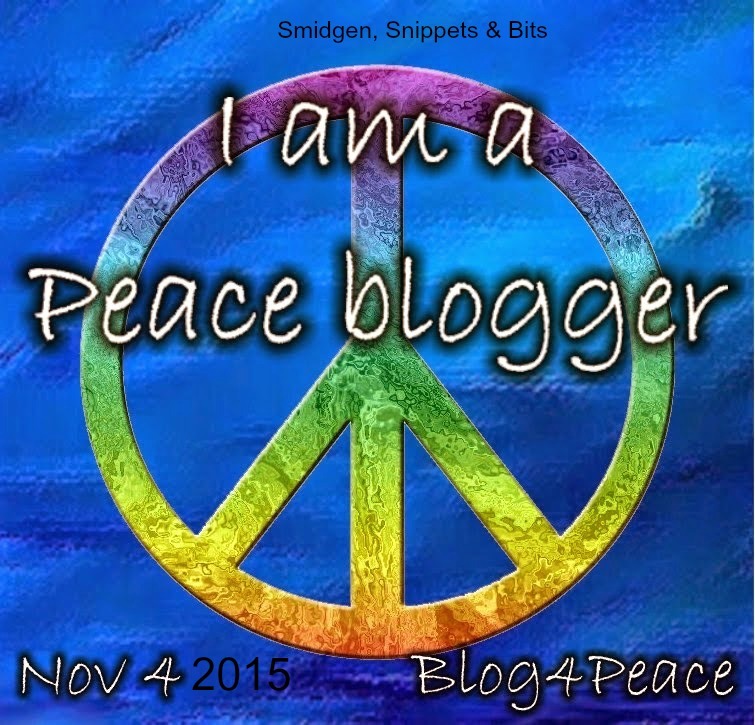 I am linking up here with others who are revealing their themes today.